On October 17, 1994, The Nation ran the headline "The Immigration Wars" on its cover over an illustration showing the western border of the United States with a multitude of people marching toward it. In the foreground, the Statue of Liberty topped by an upside-down American flag is joined by a growling guard dog lunging at a man carrying a pack. The magazine's coverage of emerging anti-immigrant sentiment shows how highly charged the images and texts on popular magazine covers can be. 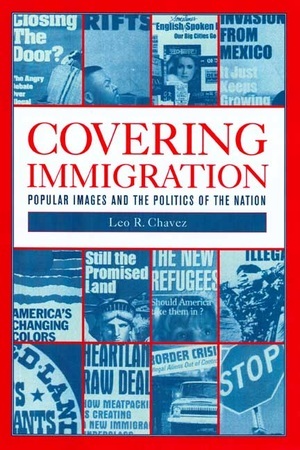 This provocative book gives a cultural history of the immigration issue in the United States since 1965, using popular magazine covers as a fascinating entry into a discussion of our attitudes toward one of the most volatile debates in the nation. Leo Chavez gathers and analyzes over seventy cover images from politically diverse magazines, including Time, Newsweek, U.S. News and World Report, Business Week, The New Republic, The Nation, and American Heritage. He traces the connections between the social, legal, and economic conditions surrounding immigration and the diverse images through which it is portrayed. Covering Immigration suggests that media images not only reflect the national mood but also play a powerful role in shaping national discourse. Drawing on insights from anthropology, sociology, and cultural studies, this original and perceptive book raises new questions about the media's influence over the public's increasing fear of immigration. Leo R. Chavez is Professor of Anthropology at the University of California, Irvine, and author of Shadowed Lives: Undocumented Immigrants in American Society (second edition, 1998).